From trademark tanks and fighter jets to the latest, unrivalled missile defense systems – the Victory Day parade stages a military show right in the heart of Russia’s busy capital. RT takes a closer look at the defense technology in the spotlight. 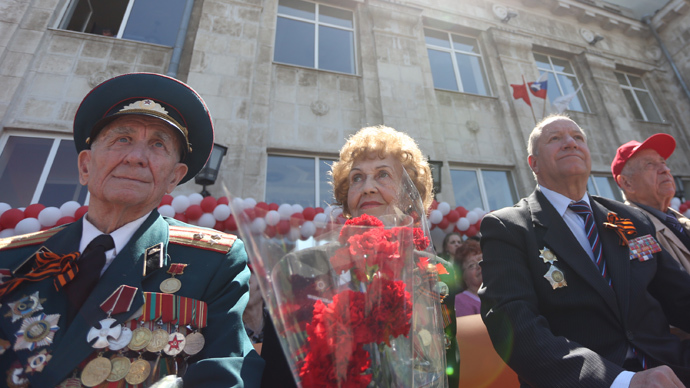 Over 11,000 servicemen from all the branches of the Russian armed forces marched through Moscow’s central square to mark the 68 year of WWII Victory. 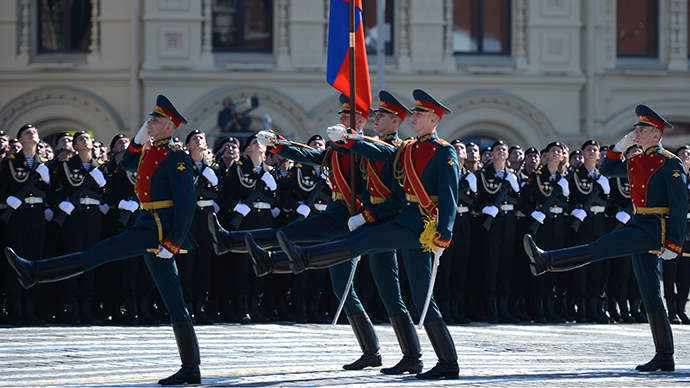 The V-Day parade has always been a prestigious event for the Russian corps – and that includes the choice of defense technologies developed in the country’s design bureaus, of which the finest are brought to the forefront. The most modern make of the Russian “flying tank” T-90A has firmly taken its place at the parade. Not only does it make impressive stunts in the spirit of its fellow Soviet T-80 – it is the best equipped heavy machine for supporting infantry. T-90’s layers of protection include recently upgraded explosive-reactive armor and an infrared anti-tank missile jamming system. Its manoeuvrability, firepower and easy maintenance have made it the best-selling tank in the world. 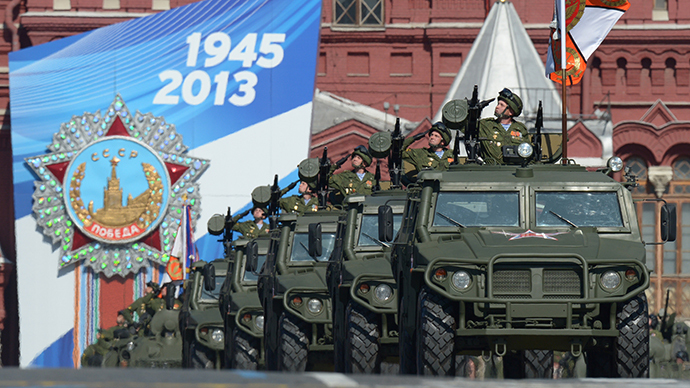 Among the parade all-timers are Russian BTRs, or 8x8 amphibious armored personnel carriers. This iconic machine has been baptized by fire in many ground operations, becoming not just a carrier, but a combat vehicle when needed. The featured BTR-82A is the latest production version with modern night vision and GLONASS navigation systems installed, as well as with improved engine power. About 30 countries currently have BTR-80 family vehicles in service. But there’re some technologies that the Russian Defense Ministry is unwilling to export despite distinct foreign interest, and a new generation anti-aircraft weapon system S-400 “Triumph” (NATO reporting name SA-21 Growler) is among them. S-400 uses 3 different missiles of varying capabilities, which can destroy airborne targets at up to 400 kilometers. This unparalleled multifunction system represents a major component of the Russian ballistic missile defense. Buk-M2 (SA-6 Gainful) is the most recent make of another Russian missile defense system brand, which is impressively mobile and easily deployed. It takes five minutes to set up Buk-M2, which can defeat most medium-range targets, such as missiles, helicopters, and strategic or tactical aircrafts. The missile system is able to operate in the presence of heavy electronic countermeasures and under intense enemy fire. The latest air defense technology is built into Pantsir-S1 (SA-22 Greyhound) weapon system, which uses phased-array radars for both target acquisition and tracking. It is said to be able to shield civilian and military objects from all the existing and upcoming means of airborne threats. Russian intercontinental ballistic missile Topol-M and tactical missile launchers Iskander-M, better known in the West by their NATO reporting names SS-27 Sickle B and SS-26 Stone, are also present at the event. The Topol-M missile, which is able to make evasive manoeuvres on its own, carries decoys and has even been shielded against nuclear explosions taking place 500 meters away, is said to be immune to any defense system. In a spectacular air show concluding the parade 68 aircraft fly over the Kremlin, featuring renowned aerobatic teams of the Russian Air Force. Helicopters take to the skies of Moscow first, with both battle and transport machines of the Mil-family hovering over the Red Square. Mi-8 and Mi-26 carrying the flags are cargo veterans used in military and humanitarian missions on all continents by many countries. They’re followed by a squadron of Mi-28’s (“Havoc”), modern all-weather attack helicopters, which can carry out battle tasks while flying at high speeds and at extremely low altitudes. The Mil’s long-time rival, Kamov design bureau helicopters with their distinctive coaxial rotor system buzz along next. The “Alligators,” as Ka-52 (“Hokum B”) attack helicopters were dubbed, have become world airshow favorites for the unbelievable stunts their high manoeuvrability allows. In Russia, the Ka-52 and its predecessor Ka-50 “Black Shark” have been chosen as the special forces’ support helicopter, while Mi-28 has become the main army’s gunship. Gigantic cargo planes, including world’s largest strategic airlift jet An-124 Ruslan (“Condor”), fly by the Red Square. Airborne warning and control system aircraft A-50 (“Mainstay”) based on the trademark Soviet Ilyushin Il-76 transport plane is among them. Multirole fighters MiG-29 (“Fulcrum”), initially designed for gaining air superiority, have proven capable of performing a whole range of different combat tasks and need little introduction. They’re followed by fighter-bombers and interceptors of the MiG and Sukhoy families, such as Sukhoi Su-34 (“Fullback”). Amid the display of strategic bombers, there’s an imitation of mid-air refueling of the “White Swan” variable-sweep wing Tu-160 heavy bomber in pair with the flying tanker Il-78. Right before the parade’s finale a battle array of Russia’s famed fighter jets Su-27 (“Flanker”) and MiG-29 speeds along. It is followed by a joint formation of the Russian Knights (“Russkiye Vityazi”) and the Swifts (“Strizhi”) – two celebrated aerobatic demonstration teams flying the same battle jets. Six Su-25 jets spectacularly close the Victory Day parade, drawing the Russian flag with colored bursts of smoke.